1. Preheat the oven to 220ºC, gas mark 7. Heat the oil in a large frying pan and cook the onion and garlic for 5 minutes until beginning to soften, then add the beef and cook for a further 5 minutes. 2. Stir in the sauce, beans and chipotle paste and cook gently for 5–10 minutes until the meat is tender and the mixture is piping hot. Stir in the coriander. 3. 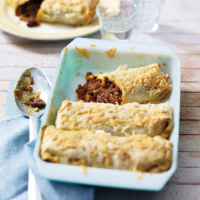 Spoon a quarter of the beef mixture onto the centre of each tortilla and divide half of the Cheddar between them. Tuck in the edges then roll up to form neat parcels. 4. Transfer to a heatproof dish and scatter over the remaining Cheddar. Bake for 10 minutes until golden. This recipe was first published in March 2014.